Pre-employment screening is commonplace in the financial services sector, largely because of the unparalleled access to sensitive personal and financial data. Turnaround time, Data Security, Quality, Level of Detail, and Accuracy of information are at the top of the list when choosing a background checking partner. BackCheck has extensive experience in designing employment screening programs suitable for companies in the financial sector. 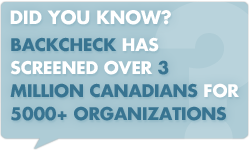 From major banks and insurers, to financial advisors and local credit unions, BackCheck is a trusted partner of many financial organizations and we complete background checks for tens of thousands of employees seeking work in this sector. BackCheck regularly assists with OSFI Compliance. We understand the unique operating environments within which you work, the unique regulations, and the heightened public scrutiny surrounding the actions of financial institutions, especially as it relates to privacy of information. Entry-level staff through to the C-Suite – Customised packages and service delivery methods to meet your requirements. Multi-site implementation – Ordering and reporting systems designed for the largest scale, allowing you easy but secure access to information at the branch and national level. International Checks – many qualified candidates now come from overseas. Read about our Global Solutions, which are chosen by many of our banking and finance customers. As consumers become more aware of security threats and identity theft, it is increasingly important for firms in the financial sector to thoroughly screen their employment candidates. Poor credit histories, records of fraud or theft, and substandard work performance are commonly revealed during the background check process.